The 2014 Scientific Conference of the Polish Society for Gestalt Psychotherapy (PTPG) was held at Edith Stein House in Wrocław last October. Its title was: ‘Between - Among - Together: Searching for What Connects Us’. Energised by this event which for me was truly excellent, I put down on paper some of my thoughts and experiences and being particularly inspired by the new interactive face of the British Gestalt Journal website, I have decided to share with its readers my reflections from the conference. On a personal note, I have become acutely aware of my reaction to the global process of fragmentation and polarisation of the past year or so. A close to home example of this has been the anti-European and anti-immigration rhetoric of British politicians and the media (particularly in regard to those coming from Eastern Europe) although not yet of the British public at large. I notice myself responding to this situation by travelling in the opposite direction; I am keen to engage with people living in continental Europe more than ever before, to make new connections, renew old ones, and to look beyond the English Channel for new inspiration. Indeed, my recent visit to Poland to attend this conference illustrates my renewed curiosity about gestalt therapy in Europe. It was the conference title itself: ‘Between - Among - Together: Searching for What Connects Us’, which I read as an invitation to reconnect with the country of my birth, which I left when I was still in my 20's. Now, a quarter of a century later, the conference in Wrocław was the first event of its kind I had attended in Poland since leaving university and the first psychotherapy gathering I had experienced in my native Polish. I took part in the EAGT Conference in Krakòw and the GATLA residential training in Ryn in 2010 and 2013 respectively but both events were organised with an international audience in mind and were mostly conducted in English. So, the PTPG conference was for me the first real opportunity to meet Polish Gestaltists. I travelled to Wrocław with many questions and bags of curiosity. I was acutely aware that all my studies in gestalt psychotherapy were in London and that I had read the basic text 'Gestalt Therapy: Excitement and Growth in the Human Personality' by Perls, Hefferline and Goodman (1951) only in the English Language; it was at the conference that I discovered to my astonishment that this seminal work of gestalt therapy still continues to await its translation into Polish! I wondered therefore, what differences there would be between Polish and English gestalt perspectives? Would I fit in or feel like an alien amongst Polish Gestaltists? Would we find a common language? Could we connect? What new could we create together? I was eager to get first-hand experience of Polish Gestalt. Having previously heard about it on many occasions from my colleagues who studied Gestalt in Poland as well as from my Polish clients, I was keen to taste it for myself at last. I returned from the conference thoroughly satisfied. For me the event was an unqualified success – I was both intellectually stimulated by its content and emotionally touched by my personal meetings with other conference participants. Even my worries about the weather in Eastern Europe were completely unfounded as the sun shone in the city of Wrocław throughout my stay there, making this gathering even more energising. Here, I wish to thank Magdalena Ryszka and Łukasz Krawętkowski of the Research Committee who organised the conference, not just for the weather, but also for having created such a great event. Their choice of the conference location, its venue and its structure, beautifully supported the theme of connectedness spelled out in the conference title. I think Wrocław was a perfect location for the conference. It is a picturesque town with twelve islands and well over 100 bridges over the river Odra on which it stands. However, in addition to its delightful setting, it has a particularly special place in Polish history because of its many different identities at various times. Over centuries this town has been part of Bohemia, Hungary, the Austrian Empire, Prussia and Germany. Soon (in 2016) Wrocław is to become the Cultural Capital of Europe. This recognition of its rich heritage is contributing to the city's friendly and open attitude which also became apparent at the conference. On reflection, I am recognising how my stay in Wrocław has also facilitated my own journey of re-connecting not only with Poland but also with myself, after my self-imposed exile from the country of my birth and formative years. Over the past 25 years I am aware of having alternated between feeling either Polish or British - never both. Now, since the conference, and at 53 years of age, I am finally integrating these two halves of my life's experience. It seems as if there is so much more of me, I feel settled and solid - indeed I can say that I feel whole. Wrocław’s rich ethnic and cultural blend of being Jewish, German and Polish was particularly apparent in the family house of Edith Stein, where the conference was held. Edith Stein, also known as St. Teresa Benedicta of the Cross, patron of Europe, was an extraordinary woman. She was a German Jewish philosopher who studied with Edmund Husserl and later worked for and with him on several of his important manuscripts. An eminent phenomenologist in her own right, she also worked with Martin Heidegger. Later in life, she converted to Roman Catholicism and became a Discalced Carmelite nun. She died in Auschwitz. Another extraordinary life brutally extinguished by the totalitarian regime, intolerant of any difference and pluralism. I felt truly privileged to be able to walk the corridors and sit in the rooms of the large neoclassical villa which until 1939 was the Stein family home. What is also significant is that it currently houses the Edith Stein Society - an organisation devoted to Jewish-Christian understanding, Polish-German reconciliation and the promotion of multicultural dialogue. I wonder to what extent the choice of this particular venue led to the connectedness of the conference title finding its place at the very heart of the event. In fact the aim of the 4th PTPG Conference was even more ambitious than fostering connectedness between the event’s attendees. The real function of these biennial gatherings, ever since the Polish Society for Gestalt Psychotherapy was formed in 2005, has been to create a platform for the integration of the gestalt community in Poland. I heard numerous delegates expressing a concern that the Polish gestalt community had remained fragmented for many years and therefore less able to support practitioners and trainees. PTPG, being an umbrella organisation, aims to bring together individuals, training institutes and centres of gestalt therapy from all over the country to offer support and to serve as a secure base for constructive discussion about the future of gestalt therapy in Poland. The gathering in Wrocław proved to be a ringing endorsement of PTPG and its aims, the organisation’s efforts were richly rewarded and its goals began to feel achievable. The conference became a safe place for personal meetings, courageous debates and creative solutions. In the words of Jolanta Cieplińska – psychotherapist, supervisor and tutor from Instytut Terapii Gestalt in Krakòw, taken from her Facebook page: ‘The new generation of therapists is coming - they have broader horizons, they are brave, they listen and are well received, they are no longer burdened by old conflicts; this generation of Europeans is open to the world and to its people’ (translation by the author). The conference organisers also wanted to highlight the current state of scientific research into gestalt therapy, in particular to encourage Polish Gestaltists to become involved in designing and carrying out their own research projects. Again, the general feeling amongst the conference delegates I spoke to, was that gestalt therapy in Poland had been marginalised in the past and its effectiveness often undermined by the official regulatory bodies because of its relatively insignificant research base. Since its very inception PTPG as a national organisation was determined (and indeed has been very successful) in achieving full recognition for Gestalt as an effective therapeutic modality in Poland. One of its feats was to organise the 11th EAGT conference in Krakòw in 2013. Nonetheless, the socioeconomic and political context of gestalt therapy in Poland, which is not dissimilar to that in the UK and elsewhere, means that there are ever more limited resources in the area of mental health and increased competition from other psychotherapeutic modalities. In this climate PTPG is currently pushing hard for an increase in research, in order to provide the public and official regulatory bodies with proof of the robustness and effectiveness of the methodology of gestalt therapy theory and practice. There were no less than five keynote speeches at the conference. Dorota Węgrzyn, one of the leading Polish psychotherapists and a co-founder (together with Zofia Pierzchała) of Instytut Integralnej Psychoterapii Gestalt in Krakòw spoke about gestalt therapy with individuals affected by trauma. Two speeches were by gestalt therapists representing what I would call the new wave, Kamila Biały and Renata Mizerska - both relatively young practitioners, with lots of enthusiasm, a fresh outlook and independent ideas. There were also two invited foreign guests who added a sense of gravitas to the occasion, Gianni Francesetti from the Istituto di Gestalt HCC Italy and current president of EAGT, and Stefan Pfleiderer, a gestalt therapist from Germany involved in the development and coordination of the Time-Series Case Study Project. I found all the speeches to be of an exceptional standard and very different from each other. This provided a delightful variety. I was particularly engaged by the presentation from Kamila Biały - a gestalt psychotherapist and associate professor of sociology from the University of Łódź. She presented a study in which she used a combination of gestalt therapy and conversational analysis grounded in sociology to analyse a therapy session with the family of a patient suffering from depression. This was a very exciting presentation which showed how two different methodologies, i.e. sociological and gestalt therapy can interweave. She described how gestalt therapy theory was employed to analyse the structure of the situation and to identify the functional dynamics of the family's interactions. By contrast the sociolinguistic analysis allowed for a detailed detection of specific patterns of communication between family members, which seemed to perpetuate the sick role of the depressed individual. Another young psychologist and psychotherapist from Warsaw, Renata Mizerska presented an important speech that depicted gestalt therapy as being a thoroughly evidence-based practice. In spite of reviewing many varied studies, looking at the effectiveness of the gestalt method when applied to work with psychiatric patients, in family therapy, in therapy with children, adults and couples which had been undertaken in recent years throughout the world, her presentation remained accessible and hence very engaging. Mizerska spoke about complex issues with ease and great clarity. To me, she is one of those people who have a real knack for plain speaking about research – a skill often difficult to master, and when achieved, a real asset which can benefit the gestalt community enormously. Alongside predominantly research-focussed keynote speeches, there were also numerous experiential workshops. I was interested to see that as many as three of them were exploring connections and differences between gestalt and psychodynamic therapies, including psychoanalysis. For me, this was not a coincidence but an expression of the process of maturation which gestalt therapy is currently undergoing in Poland. What I learnt during the conference, is that shifts between the various bodies representing Polish Gestalt over the years have inevitably led to schisms that continue to be painfully present. This in turn has been accompanied by a process of identification and differentiation within a larger field which is populated by many different psychotherapy modalities and disciplines, in particular the psychodynamic school. As an external observer, I think these differences and internal divisions do not need to be feared nor avoided but instead fully appreciated and openly communicated. In my personal view, this expression of loyalties and differences can only benefit the gestalt community in Poland. After all, ‘communication’ comes from the word ‘communion’ – the ability to share and transcend together. To use an analogy derived from Erik Erikson (1958), this is how the Ego strength of this community is developing, through defining and re-defining the identity on ever more advanced levels. Since successfully establishing its autonomy, gestalt therapy in Poland is currently redefining its identity in terms of ‘fidelity’ what it can do and with whom as a ‘young adult’, including its relationships with others without sacrificing its integrity. My participation in the workshop on ‘Gestalt vs/and Psychoanalysis’ facilitated by two renowned Polish Gestaltists, Jolanta Czernek and Tomasz Rebeta, as well as listening to conversations between Krzysztof Jedliński and Monika Sowicka from The Centre for Integrative Psychotherapy INTRA in Warsaw about their beginnings as psychotherapists in 1970s, have served to trigger my own memories related to gestalt therapy’s early gestation in Poland which was still during the communist regime. During my undergraduate studies in psychology at the University of Warsaw, I was fed the safe communist-approved pulp of cognitive behavioural science. However a therapy workshop with Carl Rogers which took place in the summer of 1979 outside of Warsaw introduced the radically new ideas of humanistic psychology. These ideas began finding their way into the students’ minds. I recall for instance, how in my first year of university, I joined other psychology students in the revolt against experiments on frogs. This was only the beginning, for a few years later the same students were protesting for their democratic rights against the political and social repression of those times. Many of us were indeed influenced and encouraged to deal with our overwhelming sense of powerlessness and oppression of those days by what we were reading - and the bulk of what psychology students read came from ‘third force’ psychology, including gestalt therapy which emphasised personal autonomy as well as the power of collective action. What I myself found most revolutionary at that time was how gestalt therapy viewed aggression as ‘not only a destructive energy but also the force behind all our activities without which we could not do anything. Aggression not only makes us attack, it also makes us tackle things; it does not only destroy, it also builds up; it not only makes us steal and rob; it also lies behind our endeavours to take hold and master what we have a right to’ (Perls, 1992, pp 42-3). Laura Perls only wrote the above eloquent description of the constructive aspects of aggressive energy at a time when Poland had already successfully freed itself from the clinch of the communist regime. However, the gestalt therapy radical call to recognise and ‘spit out’ parental, social and political introjects had been apparent in the very earliest writings of Fritz Perls, which had been circulating on campus in my days at the university in the early 1980s. Perls’ radical redefinition of aggression had an immense effect on the imagination and behaviour of young people like me. It had quite literally given us back the use of our teeth. Even today, I keep on my bookshelf at home the now yellowed copies of the then extremely precious hand-printed publication of the Polish Psychological Society, Nowiny Psychologiczne with its inscription in bold letters “for internal use by subscription only”. The 1981 edition contained amongst other articles Four Lectures by Fritz Perls – the basic text which to this day is still used by the majority of training institutes teaching gestalt therapy in Poland. It was also from the pages of Nowiny Psychologiczne that I learned about the ground-breaking work of Jerzy Nałęcz-Nieniewski and Jacek Pierzchała - two extremely inspirational and courageous psychologists, the forerunners of the Polish Gestalt movement which in those days was also a political and social force. It was thanks to both of them that the first clinical institution solely dedicated to gestalt therapy got off the ground in the form of Ośrodek Gestalt in Krakòw in 1988, and from where revolutionary ideas for humanising psychology through awareness and contact were soon spreading around the Polish countryside. At that time, I had already planted my feet on English soil. But this is enough excavation of old relics. I want to mention just one more workshop as I believe it made an enormous impact on its participants, whilst its ripple effect was felt by the whole community at the Wrocław conference. The workshop was entitled ‘Gestalt Psychotherapy – New Space’. 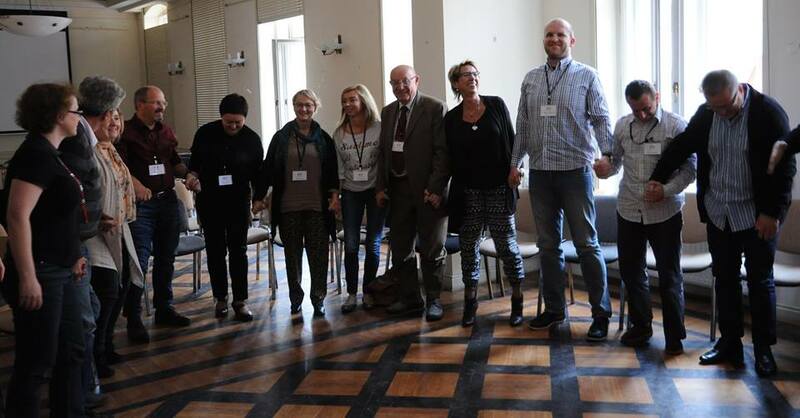 It was facilitated by Ewa Canert-Łąka, Tomasz Rebeta, Jolanta Cieplińska, and Aleksandra Replin – four senior psychotherapists, experienced trainers and supervisors and organisers of this and three previous PTPG conferences. Their workshop consisted of a dynamic fish-bowl exercise. I felt extremely privileged to be witnessing four “giants” of the gestalt therapy establishment in Poland. They not only facilitated their workshop but in the first of several fish-bowl exercises, they also placed themselves in the centre. With the workshop participants looking on from the outer circle, they discussed their experience of stepping aside from their current functions as leaders. During the course of the workshop there several rounds in which the participants had an opportunity to form their own fours in the middle of the fishbowl, to share their experiences and to explore the new space that had formed after the members of the “old guard” had stepped aside. I was fascinated by this process - a meeting between the elders and the less experienced practitioners, which included trainees who were volunteering at the conference – the power to move on versus holding on to control – wisdom and experience versus new potential and creative energy. The initial two rounds were characterised by looking back in which the participants described feeling self-conscious, whilst in the later rounds the process of moving forward became apparent and there was a growing engagement between participants, who began building on each other’s potential, skills and capacities for creating a novel experience. When the fishbowl ended and the workshop again formed into one large group, the participants were really engaged when talking about their bodily and emotional processes. Some were deeply moved by what had happened, others exchanged ideas and imaginings about what was going on between the four participants of each round. There was also a discussion about the potential implications of this experiment for PTPG and the whole of the gestalt community that it represents. The workshop was a typical gestalt experiment in the here and now which managed to engage everyone and created a lively dialogue between the participants – a truly experiential learning experience which in my view had an immense impact on the rest of the conference proceedings. I observed far-reaching implications from all the activities at the conference, including the above described fish-bowl exercise. Indeed, I found that the way in which the whole of the conference in Wrocław was structured really served to create an environment for meeting and for making connections, and in effect supporting the excitement and growth of the Polish gestalt community. In fact, this conference began differently from what is often the case, with workshops in small groups rather than with an opening ceremony and keynote speech. This innovative approach, born out of necessity as not everyone was due to arrive at the beginning, allowed participants to get to know each other through doing things together. So by the time we took our seats for the opening speech, I had already met over a quarter of all the participants. Also, from what I understand, the process groups - a unique gestalt therapy approach to conferencing, were introduced for the first time in Wrocław. I participated in a group facilitated by Ewa Cenert-Łąka, the then PTPG president. She invited participants to share their experiences and chew together on their observations and learnings. This daily interaction in a smaller space had enabled me to gradually realise the unique meaning that the Wrocław conference had for me. In fact my reflections which are summarised in this article, originate from this experience. Furthermore, the stimulation of free expression and exchange in process groups had also been the basis of the emergence of the highly engaged and connected community which was so apparent throughout the conference, and which was commented on by numerous participants during the gathering and in the large circle at the end of the conference. This final meeting of the conference participants, organisers and volunteers was not scheduled but instead happened spontaneously. This reminded me of Philip Lichtenberg (2010) once saying that: ‘Dialogue involves the creation and support of individual particularity of all participants in the relation leading to communion among them at final contact’. I feel enormously grateful for having been able to participate in a conference that enriched me as much professionally as personally. I want to give equal praise to the organisers, the delegates and indeed the volunteers, many of whom were psychology students interested in gestalt therapy, for having created for me such a great experience. I was inspired by the ability of all the participants to engage with great enthusiasm and with what felt like unlimited energy, in the theoretical lectures, the experiential workshops and the process groups. I hope this enthusiasm will carry on beyond the conference, within me and within others, as well as within PTPG and will continue to positively influence our personal and therapeutic space wherever we live and work. Piotr Mierkowski, MA, Dip Psych, is a UKCP registered psychotherapist and senior counselling practitioner in private practice in North London. He is a graduate of the Gestalt Centre London and has undergone considerable training in body therapy. In clinical practice for over twenty years, Piotr works with individuals and couples in English and Polish, and offers supervision. His particular interest lies in attending to the unique ways in which we relate to others and to events in our lives.